Cape May  is in the state of New Jersey, in the United States. It lies at the southernmost point in New Jersey, on the Cape May Peninsula, on the coast of the Atlantic Ocean. On the other side of the Delaware Bay lies the state of Delaware. Cape May, located at the very southern tip of New Jersey, is a Victorian resort town. It was the country's first seaside resort and much of the original flavor still exists in the properties and other sites within the city. Settled by whalers and fishermen in colonial times, the town suffered a devastating fire in 1878 and was rebuilt during the Victorian period. As a result, Cape May is known for its concentration of Victorian era architecture. It was declared a national historic landmark in 1976. A canal, dug from a natural shallow creek, runs from Cape May's harbor to the Delaware Bay, which makes Cape May an island. In fact, historically, it's known as Cape Island. The two main industries within Cape May are tourism and fishing. Cape May is second to Atlantic City for tourism in the state of New Jersey. Being at the confluence of the Delaware Bay and the Atlantic Ocean allows Cape May full access to many types of fishing opportunities. Cape May is also home to the Coast Guard Training Station. The nearest large airports to Cape May are Baltimore-Washington International (BWI), in Baltimore, Maryland, Philadelphia International and Newark International. From these airports you will either have to fly to the smaller airport in Atlantic City and drive for about an hour, or drive directly, which will take approximately three hours. For those with private aircraft, there is a small airport (WWD) just a few miles out of town. The closet rail terminal is Atlantic City, NJ (about 45 minutes by car or two hours by bus to the North). This station is served by NJ Transit's Atlantic City Line from Philadelphia and is connected to Cape May by NJ Transit bus, see below. Drive time to Cape May is about three hours drive from the New York City metropolitan area and from Baltimore, Maryland. If you fly into Philadelphia, it only takes about two hours (assuming you hit good traffic). If you're able to fly into Atlantic City, you can make it down in about 45 minutes. New Jersey Transit runs the 552 bus route from Atlantic City to Cape May. From the New York Port Authority Bus Terminal, take New Jersey Transit bus route 319 to Atlantic City. A Few 319 buses wiil terminate and begin in Cape May, check the schedule. Note: New Jersey Transit runs a summer schedule on these two routes when school is out for the summer. So pick up a printed schedule when in doubt. The Web site for New Jersey Transit publishes the normal schedule. Cape May has complete harbor access from the Delaware River and the Atlantic Ocean. It is on the Atlantic Intracoastal Waterway, so it is accessible to boaters from Key West, Florida to Boston, Massachusetts. It is also possible to take the Cape May-Lewes Ferry  from Lewes, Delaware to Cape May. Cape May is a relatively small town, compared with other mid-atlantic and southern United States resort communities. While cars are allowed on the island, it's best to park it and walk or take a bike. The flat terrain makes biking ideal. Cape May Bird Observatory 701 East Lake Drive, tel: (609) 884-2736. Daily 9AM-4:30PM. If birds are your thing, Cape May is the Mid-Atlantic answer to the Everglades. The wind currents carry migratory birds out over Cape May, so it is one of the best birding spots on this part of the East Coast. Everything from ospreys to herons, to gulls, plover and sand pipers, birding in Cape May is an attraction all by itself. Spring Weekend Festival in May. Cape May Lighthouse, Cape May Point State Park, Lower Township. The Cape May Lighthouse is one of the oldest continually operating lighthouses in the United States. It has beckoned to navigators from the mouth of the Delaware Bay since 1859, and is listed in the State and National Registers of Historic Places. Still an active aid to navigation, the light, itself, is maintained by the U.S. Coast Guard, while the tower is maintained, interpreted and opened to the public by the Mid-Atlantic Center for the Arts & Humanities (MAC), and is one of Cape May's and New Jersey's most popular attractions. Since MAC restored the tower as a historic site and opened it to the public in 1988, over 2.5 million people have climbed the 199 steps to the tower's Watch Gallery for a glorious view of Cape May, Lower Township, Cape May Point and the mouth of the Delaware Bay. At 157.5 feet, the current tower is the third such structure to be built on the site. The light flashes every 15 seconds, operates nightly, and is visible 24 miles out to sea. MAC lighthouse keeper interpreters answer questions from the public on site about lighthouse history, the historic role of the lighthouse keeper and Cape May history. The Oil House Museum Shop is located on site and offers maritime and lighthouse souvenirs for purchase. Cape May County Zoo -- actually located 10 miles away from Cape May in the small charming town of Cape May Court House, drive to the zoo and see lions, tigers, bears, giraffe, zebras, and many other animals. Dolphin and Whale watching -- some of the boat owners guarantee aquatic mammal sightings on every trip. Dolphins seem to be the normal sighting, as hundreds of dolphins summer around Cape May. Whales? Bottle-nosed dolphins are part of the whale family, but are not the only whales in New Jersey. Humpback and Fin back Whales are sighted with frequency throughout the year. Two or three hour boat rides are common. For example, aboard the Cape May Whale Watcher, tel: (609)884-5445  (check out the whale videos on the website) you can enjoy a two hour dolphin watch and history cruise or sunset cruise around the island of Cape May, NJ. The "Cape May Whale Watcher" is the original whale and dolphin watcher in New Jersey. Tickets are available through the Mid-Atlantic Center for the Arts & Humanities (MAC) or on the website. Salt Marsh -- Take a tour of this Atlantic coastal Salt marsh aboard one of the area's boats. For example, aboard the Skimmer, tel: (609) 884-3100,  which will take you on a journey in search of one of the many creatures that live within the salt marsh. The Skimmer is named after one of the many shore birds that live in the area. The Famous "Painted Ladies" of Cape May - Victorian home tours. Stop at the Washington Mall Information Booth and check out the trolley and house tours of the area that cover the history, ghosts and stories about some of the most beautiful homes in the area. The beach' --- Cape May point beach tags can be purchased, or head to Sunset beach to look for Cape May Diamonds. Parasail -- See cape May from the air. It is extremely safe and fun. Try East Cost Parasail located in Cape May New Jersey 1121 Rt 109 08204 609-898-UFLY  email at [email protected] or Hang Loose Parasail, (609) 522-WILD, in Wildwood . You'll love the relaxing view of the whole island from 500' in the air. Bike -- Cape May is still a relatively small town (in diameter) so biking is a very practical way of getting around. There are a number of bicycle rental places within Cape May, where you can rent everything from the average one-speed two-wheeler to a four-wheeler that seats four and includes a basket for your beach toys or shopping bags. Fish fresh water fishing can be had in several small lakes located around the area. The back bays, surf, Delaware Bay and open Atlantic Ocean allow for many more (surf and deep sea) fishing opportunities. The Miss Chris Marina  tel:(609)884-3351 offers Daily Deep Sea Fishing Opportunities aboard the so called "Head Boats, or Party Boats" for four, six or eight hour fishing trips, as well as Kayaking and boat rentals and a nice tackle shop. At the Miss Chris Marina they also offer Whale and Dolphin Watching Trips, Sightseeing, and Dinner Cruises. Kayak -- take a sea kayak on a ride, and explore the many nooks and crannies of the salt marsh. Surf -- Wildwood, just to the north, is known for big surf. Ocean City, about 45 minutes north, has a section of beach reserved for surfing. 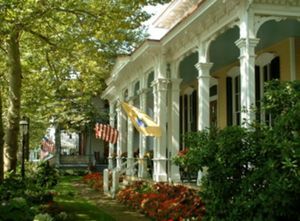 Tour -- Learn about Cape May, its history and architecture on one of many tours around town offered by the Mid-Atlantic Center for the Arts & Humanities (MAC) 1048 Washington St., tel:(609) 884-5404 or (800) 275-4278, . Since 1970, the not-for-profit Mid-Atlantic Center for the Arts & Humanities (MAC) has been bringing Cape May history to life for millions of visitors, providing tours, activities and events in every season from February through December that enhance visitors' experience of this historic seaside town. MAC is the steward of Cape May's three historic sites, the 1879 Emlen Physick Estate, the 1859 Cape May Lighthouse, and the World War II Lookout Tower (Fire Control Tower No. 23), in addition to offering visitors dozens of professionally curated trolley tours, house tours and walking tours that illuminate Cape May's history and architecture. MAC has a professional staff of 24 full-time and approximately 125 part-time professionals who provide visitors information at the Washington Street Mall Information Booth, educate the community and schools with dozens of educational programs, lead tours throughout Cape May and the surrounding area, coordinate group tours of Cape May, promote Cape May to local, regional, national and international audiences, provide cultural programming such as the annual Lessons of History lecture and the annual Cape May Music Festival, mount exhibits annually on aspects of local history, and work with partners throughout the resort. MAC has a membership of 3,500, an annual budget of $3.5 million, 80% of which is in earned income, and an annual visitation of 296,000. Walk -- the boardwalk, or throughout town. Lots of Cape May can be reached by foot. Walking is the preferred method of travel for many Cape May residents and visitors. Restaurants, bars & hotels are undeniably the largest employers on the island. Much work available here is seasonal only. One of the shopping areas in Cape May is the Washington Street Mall , located in the heart of the town. This three-block outdoor mall features a variety of family-owned shops unlike any others, although many are not open during the week in the off season. Call ahead. The Flying Fish Studio, . There is a wide variety of dining available in Cape May, from family and elegant to seafood and pancakes. However, many restaurants operate on a seasonal basis. Most restaurants are open seven days a week from Late May through early October. After that, it's best to call ahead. There are good places to eat on nearly every corner. Good pizza and lots of good italian food. Seafood and burgers are easily found at budget prices, though it might be wise to search for seafood at mid-range prices and above. There are many places where it is possible to get very good food (esp. sea food) at reasonable prices. One can buy fish right off the boats coming in from the day's fishing. The Bar and Restaurant at Martini Beach 609.884.1925. Mediterranean/Tapas. Cape May is known for its many fine restaurants. The town's been dubbed the Restaurant Capital of New Jersey. Cucina Rosa, 301 Washington Street Mall , toll free: 866-345-7672, tel: (609) 898-9800, . 410 Bank Street, 410 Bank Street, tel: (609) 884-2127. Freda's Cafe, 210 Ocean Street, tel: (609) 884-7887. The Pilot House, 142 Decatur Street, tel: (609) 884-3449,  on the Washington Street Mall has a full bar serving all day, every day of the year. Happy hour with free appetizers Monday-Friday from 4PM-6PM. Friendly vibe, plus a full restaurant. Carneys, 401 Beach Ave., tel: (609) 884-4424. located just steps from Cabanas, is great both day & nighttime. Step over from the beach for a frozen drink. The Ugly Mug, 426 Washington Street, tel: 609-884-3459, , a Cape May institution on the Washington Street Mall. Cozy, pub-like atmosphere. Merion Inn, Decatur Street. Adult atmosphere with piano music. The Pier House, 1327 Beach Av., tel: 609-898-0300. The Schooner Bar, at the Lobster House. Lucky Bones Backwater Grill, across from the Lobster House. Cabanas & Martini Beach, corner of Decatur and Beach,  are casual & fun. Martini Beach  is located on the second floor and has a quieter, more intimate feel. Cabanas features a club atmosphere with live music. The Brown Room and The Boiler Room at Congress Hall . Wildwood. The town on the other side of Cape May Harbor (up the peninsula) has a long boardwalk and several large areas with amusement park rides. There are at least four roller coasters. It all gets busy later in the evenings, especially on Friday. Wetlands Institute of Stone Harbor - Learn about the important residents of Cape May, like the Horseshoe Crab, the Red Knot or the Terrapin. Great for the kids. This page was last edited on 11 December 2018, at 18:40.